TrustMovies: Same sleaze, different decade: Choi Kook-hee's riveting, provocative DEFAULT is like a South Korean Big Short -- and very nearly as good! Same sleaze, different decade: Choi Kook-hee's riveting, provocative DEFAULT is like a South Korean Big Short -- and very nearly as good! According the DEFAULT -- the rip-snortingly good financial thriller than opens theatrically this coming week -- during the Asian financial crisis of 1997, South Korea was about to go bankrupt due (as usual) to the rotten and/or incompetent men in charge of both the banks and the government and the near-complete lack of (or merely the ignoring of) regulations. Yet even he pales in comparison to the movie's real villain, the vice-minister of finance (played by Jo Woo-jin (center left on poster at top, and at left, below). 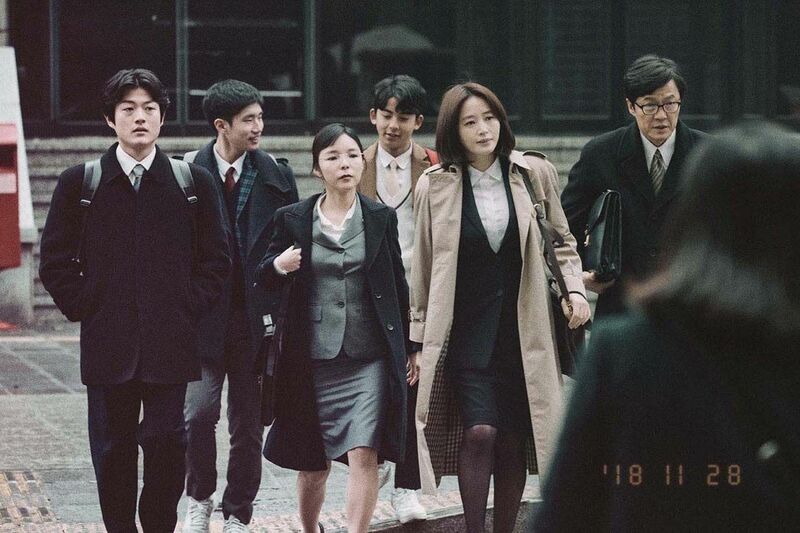 Against that vice-minister (against the whole rotten legion of avarice and incompetence) is a lone woman, Ms Han, the monetary policy manager at the Bank of Korea (Kim Hye-soo, at right on poster, top) and her helpful team. 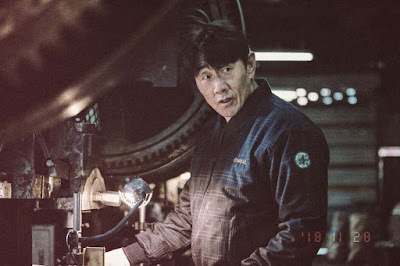 Ms Han is smart and steadfast, but the power arrayed against her is formidable indeed. And the filmmakers allow us to see how that power makes itself felt in so many ways, subtle and not so. 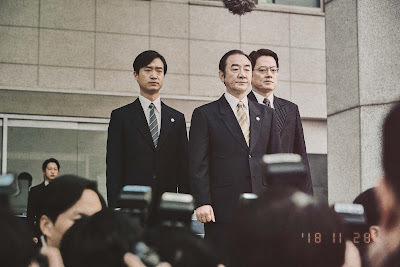 Choi and Eom also elect to tell the tale via a quartet of of people, who together give us a well-chosen array that makes this whole financial melt-down both understandable and moving. 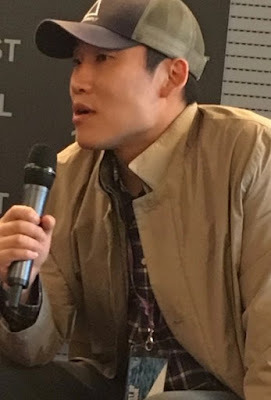 In addition to the protagonist, Ms Han; her nemesis, the vice-minister; and the young upstart who will reaps million in profit, we also see the typical "little person" -- in the form of ceramic producer and family man Gap-su (Huh Joon-ho, below), who in order to make a major sale to a large department store, agrees to accept a promissory note rather than the usual cash payment. How all this plays out proves fast-paced and very smartly done. 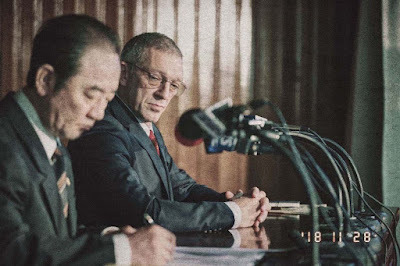 Though Ms Kim makes a fine feminist heroine, and the movie is a model of important progressive ideas and actions, things nonetheless grow progressively worse for the good guys, as the bad ones bring in the IMF and its "negotiating" power (in the form of French actor supreme, Vincent Cassel, below, right) to bully its way to what is best for both government and corporate power, leaving the general populace to suffer the consequences (and pick up the tab). It is particularly good to see the IMF pilloried for its former actions. Has it, together with The World Bank really changed so much, as both organization tell us? TrustMovies hopes so, but perhaps he can be forgiven for having some doubts. As usual with so many new South Korean films, the production values are as classy and impressive as the casting, plotting and all else. Default, in just under two hours, tells its cautionary tale about as well as seems possible. It will leave you angry and ever-mindful of why government, the banks and financial sector, as well as the uber-wealthy, must be kept in check by regulations and vigilant watchdogs. The movie ends with a surprise relationship reveal that, while maybe moving, seemed unnecessary to me. Much better is the epilogue that leaves us with a smattering of hope for the future, as it simultaneously takes us 20 years forward to 2017 and brings us back to the film's beginnings. 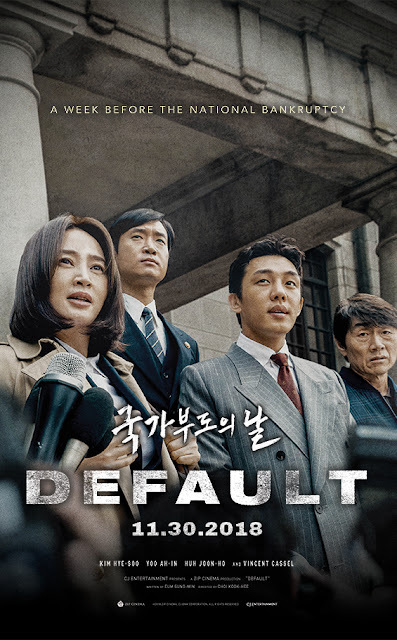 Default is a must-see for anyone who appreciates films about politics, finance, economics and chicanery on a national level. 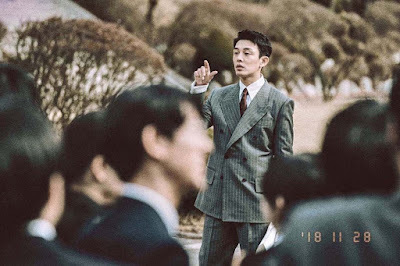 From CJ Entertainment and running 114 minutes, the film opens this Thursday, November 29 at CGV Cinemas Los Angeles and Buena Park, and in many other cities across the U.S. on November 30 and in then in Canada on December 7. To see all U.S. playdates, cities and theaters, simply click here, and then click on Theaters on the second line of the task bar atop the screen.